Usually when an anime is adapted from a visual novel of some kind, that visual novel’s plot revolves around one young man and a large group of women who gather around him. Rarely do we find a visual novel that is packed with drama and suspense given an anime adaptation, however back in mid-2011 one such adaptation was created. Steins;Gate, originally developed by 5pm. and Nitroplus for release on the Xbox 360, was critically acclaimed by the Japanese media and the subsequent creation of an anime delighted many. 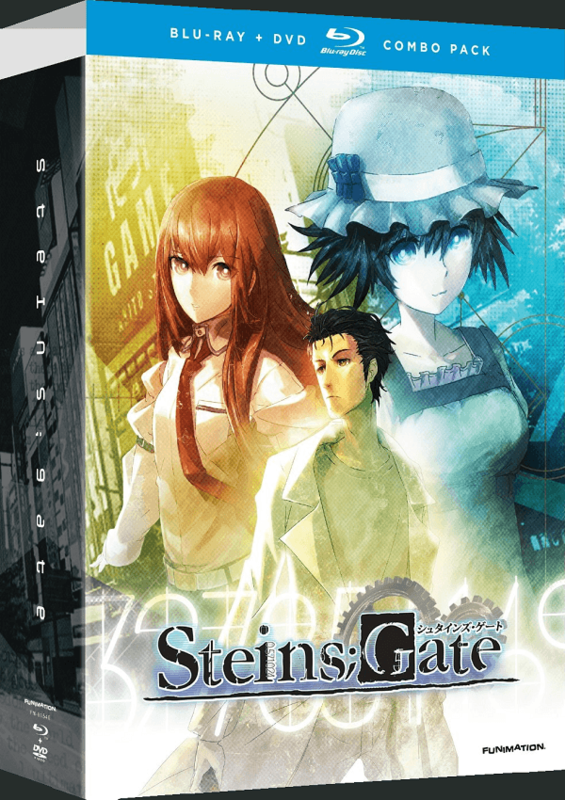 Now FUNimation has brought Steins;Gate to North America in two parts. Does the first half of the series ensnare the viewer in an intricate storyline that will hold them throughout both parts? We shall see. In what is stylized as modern day Japan, a rather eccentric and slightly delusional college student named Rintarō Okabe who claims that he is a mad scientist is attending another scientist’s discussion on time travel. However during the event he stumbles upon a girl named Kurisu Makise who for some reason says that she had met him only fifteen minutes prior, though he never remembered seeing her before. 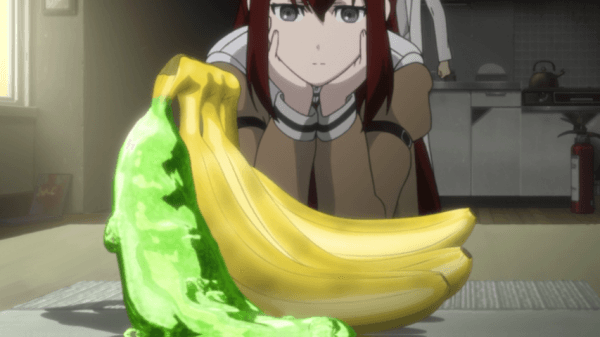 After leaving the scientist’s discussion with his female friend Mayuri, a scream is heard in the building and Okabe finds Kurisu dead and laying in a puddle of her own blood. As he leaves the area in shock, he sends a text message to another one of his friends Itaru Hashida but as soon as he sends the text, the world around him changes and the once busy street has cleared of people. Too his dismay not only has a satellite crashed into the building he was just standing in, but no one around him remembers anything about the lecture nor the fact that they were ever in the building. While this bizarre turn of events may be startling to most, Okabe continues on with his day and returns home where we learn that there is a good reason that Okabe calls himself a mad-scientist. He is the leader of a small group who is planning on discovering time travel. While trying to discover a possible way to travel through time, Okabe and Daru (Itaru’s nickname) find that they have actually created a time machine in the form of a microwave hooked up to a cell phone. Not only does this microwave manage to transport a banana back in time (gelatinized however) , but the group soon discovers that they can actually send text messages back in time to their former selves. Too make things even more complicated, the previously dead Kurisu appears alive and well, eventually joining the group’s efforts to better understand their time travel device. However things aren’t all fun and games, as text messages sent to the past can have an irreversible effect on the present, altering minor to major details in the world. While the group tries to understand the machine, the changes to the timeline grow worse and only Okabe manages to retain his memories between these jumps. 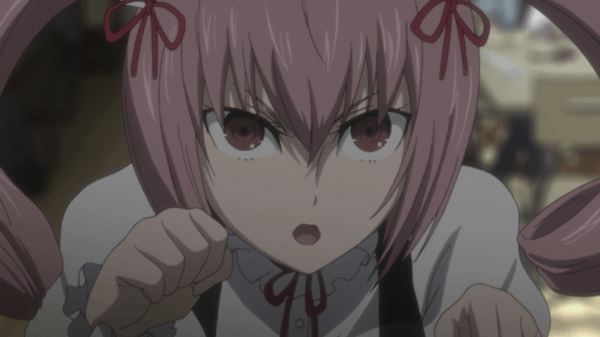 Though with another supposed time traveler called John Titor warning of a future where an evil organization uses time travel to rule the world with an iron fish, Okabe’s own concept of events unwinding and more occurring around the group, can Okabe manage to keep everything together and discover what exactly is happening? If it sounds like Steins;Gate has a whole lot of storyline going on at one time, you are absolutely correct. However despite the dense plot the anime never lets the viewer feel too overwhelmed or let the plot become muddled as most of the intricacies of time travel are explained throughout Part 1 and viewers learn alongside the characters in the show. This not only helps the show flow fluidly but also allows for minor character development throughout. Part 1 is presented mostly lighthearted and comically with the main character Okabe presenting most of the humor with his outlandish behavior and comedic belief that an “Organization” is out to get them. Combine his eccentric behavior with the other members of the cast who join the group along the way and we find a well-functioning cast of characters that begin to feel something like a family. Now Part 1 brings us to the midway point of the storyline and as mentioned before, while most of the first half is played for laughs things begin to take a dark turn as more revelations about time travel and other factors in the world come into play. As such, Part 1 leaves off with a killer cliffhanger that will leave viewers wishing that Part 2 would come faster. Steins;Gate is a rather beautiful looking series with excellent artwork both on the characters as well as the backgrounds. The characters are well designed, especially when it comes to Okabe, and the close-ups of a character’s face during dramatic moments helps raise the tension greatly. In fact, a number of the characters in the series are designed rather different from each other and go a bit outside the norm by having a rather large individual be a main character. 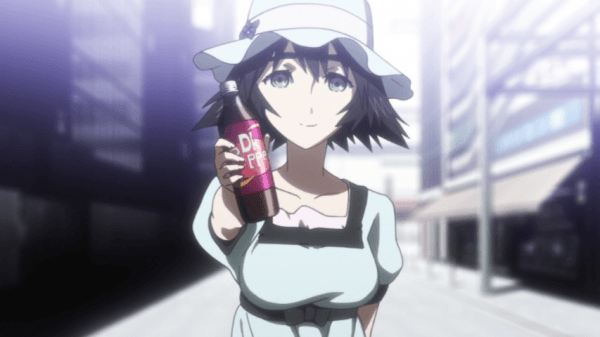 It is worth noting that Steins;Gate uses a rather subdued color palette, but this ultimately works for the best as any brighter colors that are used ultimately accentuate plot points or certain objects. Another thing worth noting is that Steins;Gate features a lot of text messaging and therefore text reading. Thankfully FUNimation has done a good job with translating all of the texts that are shown on screen with subtitle displayed over the object, though larger messages usually have to be paused and read thanks to their short display time. As standard with a FUNimation release, Steins;Gate Part 1 includes the original Japanese dub as well as the brand new English dub. The English voice work for the series is handled quite well though there are a few times that it sounds like the quality of the recording itself takes a dip for the worse. 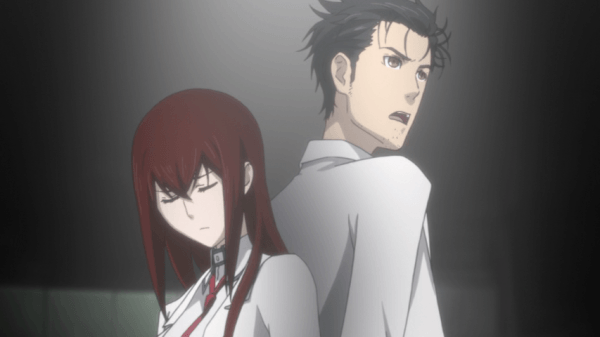 This is a shame as Michael Tatum’s portrayal of Okabe and Trina Nishimura’s work as Kurisu are the two stand out performances in the series, though Jackie Ross also deserves a mention with her portrayal of the always positive Mayuri. Steins;Gate features a rather light set of background music which is usually forgetful outside of dramatic moments in the show. On the other hand the theme opening song “Hacking the Gate” by Kanako Itō is impressive sounding and worth listening too often and the ending song “Toki Tsukasadoru Jūni no Meiyaki” by Yui Sakakibara happens to follow along the same lines. As far as Bonus Features go, Steins;Gate comes with your standard faire of trailers for other FUNimation releases, a clean version of the opening and ending theme song as well as two episode commentaries. Outside of the norm is a rather simplistic Akihabara map tour done through the menu system that shows the location of some areas in Steins;Gate if they were in the real Akihabara. As far as the episode commentary goes, Episode 1 features Trina Nishimura the voice of Kurisu and Tyson Rinehart who voices Itaru/Daru. The two of them spend a lot of time discussing how this is Rinehart’s first major role in a FUNimation series and past works of his. This one is rather hilarious as the two spend a lot of time joking around with only a little focus on the episode itself. Episode 12 on the other hand features J Michael Tatum who voices Okabe and is also the Lead Writer and John Burgmeier who is the head writer on the series. The two spend a lot of time talking about technical aspects and the writing in the show, while also discussing how they worked in Western references such as Back to the Future so the original Japanese references wouldn’t fly over the viewers’ heads. It is worth noting that this commentary should be avoided until the viewer watches the entirety of Part 1, as the two also discuss how the show takes a darker turn. Steins;Gate does a great job sinking its claws into the viewer with Part 1 and doesn’t let go throughout the first twelve episodes. 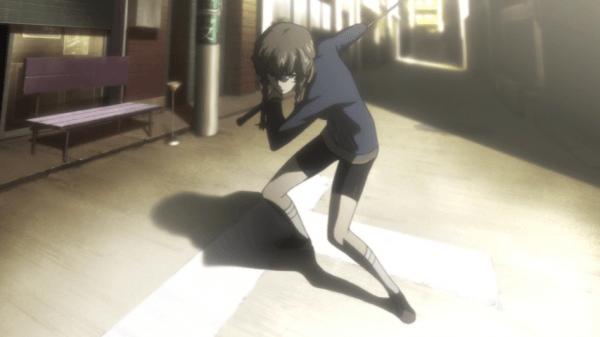 While slowly introducing the time travel logic used in the show and the various alternate realities that spring from the group’s actions, viewers will grow invested in the intriguing storyline and the characters themselves. 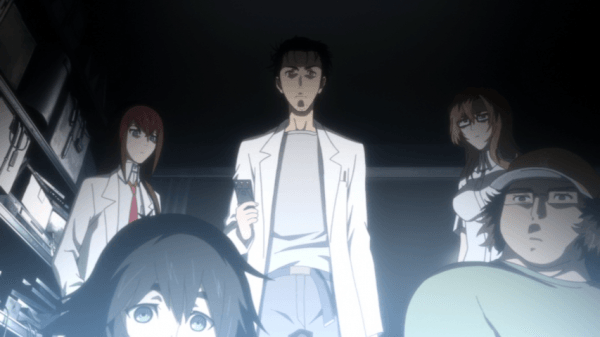 With an impressive presentation, top-notch voice work and a story that will leave viewers begging for Part 2, Steins;Gate is an anime that simply should not be missed.